Clearing has begun at the detention basin located at the corner of Richard and Hamilton Streets. E.T. MacKenzie Co., based out of Grand Ledge is the Contractor working for the Drainage District on the project. They are removing trees and brush, chipping the material, and soon will be hauling it from the site. By the end of this week excavation and hauling of earth material to construct the detention basin will commence. Neighbors in the area should expect to see large equipment moving in and out of the site along Richard, Dean, and Auburn Streets. The construction of the detention basin has been estimated to take approximately 2 weeks. As with all construction projects this timeframe is subject to weather and any other unforeseen delays. Once the detention basin has been constructed, the mainline storm sewer pipe will be installed along Richard Street. This work will require the contractor to close Richard Street to through traffic but access for local landowners will remain open. The installation of this mainline sewer from Hamilton Street to Auburn Avenue could take up to a month or even longer. 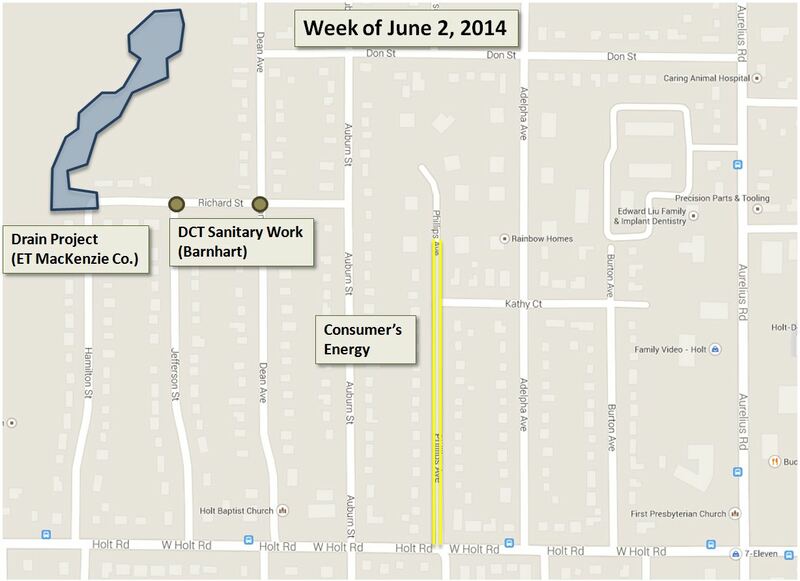 Consumers Energy is continuing to relocate their gas mains ahead of the drain project. They have completed the work on Auburn and Richard Streets. They are currently working on Phillips Ave. and closing in on Adelpha, Kathy Kourt, and Burton. Delhi Charter Township is in the process of replacing two sanitary manhole structures located at the intersections of Richard and Jefferson, and the intersection of Richard and Dean. This work should be completed by the end of next week. The contractor working for the township on this project is Barnhart and Sons Inc., based out of Holt.